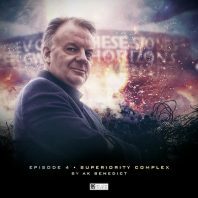 Part one of three of Torchwood’s official fifth series that has gotten off to such a demonstrably strong start comes to a close with ‘Superiority Complex’ by AK Benedict as the streets of Cardiff are filled with the desperate and dispossessed as poverty and homelessness continue to escalate. It thus may seem an odd time to open a luxury hotel, and especially one that caters exclusively to aliens as humans amass outside and look in angrily and hungrily. When something begins murdering the guests, however, thinly-veiled xenophobia comes to the forefront in a powerful tale that weaves in both politics and economics expertly. The Cardiff Intelligent Hotel and Spa is an eight-star hotel catering to its alien guests by anticipating their every need and providing pleasurable results before a question can even be asked. With staffing contracted to 3Sol and lending a nice bit of continuity to the story by linking it with ‘Changes Everything,’ Benedict continues the world-building set in motion in the three previous tales and reveals that humans are only allowed to enter the building as members of the lowest positions of the subservient staff. The aliens here are repulsed by the very sight or idea of humans, and given that they have taken up residence on Earth, this concept parallels rather effectively with British colonial explorers establishing themselves atop the many societies and cultures they came upon when the world began to shrink and the map began to fill in more detail. However, when the clientele becomes the target of murders, Torchwood tries to uncover if these attacks that seem alien in nature are truly alien or the result of someone who wants them to look alien. Benedict includes plenty of innuendo and humour befitting of Torchwood in the script, but the uncovery of the hotel’s sentience due to the inexplicable attacks and the strange transformations of Orr within its confines is a wonderful twist that, although one that has been seen in other Big Finish releases through the years, puts everything into a wholly new context. This is a fledgling being that was given the mind of an adult and then tasked with appeasing countless others, and it grew upset at first with the humans trying to riot and then by the manager’s attempts to quell this anger by murdering those same humans in the name of entertainment. Fittingly, it’s Orr who manages to communicate- not wholly successfully- with the hotel by empathising with this being who has never been asked what it wanted while aiming to please others, and Sam Béart delivers the needed emotion for this scene to work spectacularly while ensuring that Orr’s unique past remains at the forefront after previously making inroads with masseuse Suzanne Williams. With Jack, Gwen, and Colchester also present to try to solve the mystery and prevent further deaths as the hotel and manager both turn even deadlier, each lead has a moment to shine that exemplifies the very best of these characters, and the touching moment between Colchester and Jack after the latter again sacrifices his life gives an added nuance to both that adds a welcome new dynamic to their relationship. The trouble at the hotel has even come to the attention of newly-installed interim mayor of Cardiff, Ro-Jedda, following the unfortunate demise of her predecessor, and the tenuous relationship between Ro-Jedda and Tyler who has become established in the mayor’s office is an intriguing one that will assuredly continue to cause havoc for Torchwood in the future now that the Sorvix invasion has experienced a seminal moment. As the conclusion to this first set of four stories, however, ‘Superiority Complex’ has delivered an engaging central concept while also advancing the Sorvix plot, developing Cardiff’s current dangerous state, and showcasing each of its leads brilliantly to leave fans eagerly awaiting the next instalment of Aliens Among Us following four stories that have together set such a high bar with scripts, performances, direction, and sound design for an overall wonderful production.